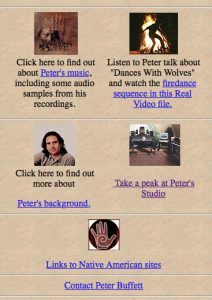 We have to include the Peter Buffett website in our list of Top 100 projects—it was the very first project we did! By today’s standards, this website is extremely archaic. But for those of you that are old enough to remember, think back to what the internet was like 20 years ago. This was a highly innovative website at the time, optimized for your 56K dial-up modem! There were very few musician sites around in 1997 and even fewer with music samples that you could listen to. And then watch a video clip? Well that was pretty much unheard of. Of course you had to wait for the clip to download and then it was just a little bigger than a postage stamp and very pixelated. Plus you needed to have Real Player or Windows Media Player installed on your machine in order to watch it (and that sometimes confused people.) But it was there!